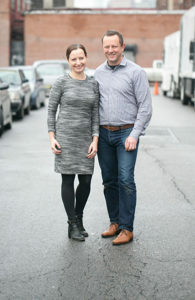 Started in 2005 by husband and wife team, Caroline Bell and Chris Timbrell, Café Grumpy is a specialty coffee roaster located on Diamond Street in Greenpoint. What began as a local coffee shop aiming to provide the neighborhood with great coffee has grown into a roaster, wholesaler, and online retailer. Sourcing from farms around the world including Kenya, Guatemala, and Honduras, Café Grumpy’s laid-back style and bold flavors have put Greenpoint on the coffee map. From its location in Greenpoint, Café Grumpy has quickly grown to have nine locations with eight throughout the city and one in Miami. Its ability to adapt to changing tastes and trends has allowed the brand to grow while maintaining the casual essence that has made it successful. Currently, Café Grumpy is gearing up to open its tenth location in the soon to open The Market Line at Essex Crossing. Café Grumpy’s offerings have expanded since its first opened as it has looked to cater to changing tastes and trends. Its menu at its cafes offer typical coffee drinks such as americanos, lattes, cappuccinos, and macchiatos, but it also offers matcha teas and specialty coffees with turmeric, rose, and cardamom. Due to the surge in demand for cold brew, the drink has grown to be its most popular beverage and is sold not only at Café Grumpy coffee shops, but wholesale in concentrate and ready to drink forms. In addition to its wholesale offerings of coffee beans and cold brews, Café Grumpy also offers coffee subscriptions and routinely caters events. For those of interested in learning more about coffee and improve their coffee-making techniques, Café Grumpy offers classes from its Training Lab in the Lower East Side. The transition from coffee shop to coffee roaster was not easy, but Café Grumpy’s dedication to quality products and versatility has brought it success. While having a business in New York City is expensive and there are many hurdles to overcome, they are hooked on New York’s energy and creative atmosphere. In the future, they hope to expand their presence and work on ways to incorporate more sustainable packaging, cups, and utensils for their wholesale lines and shops.